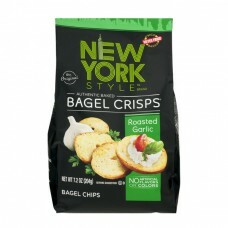 New York Style™ Brand The Original Roasted Garlic Bagel Crisps®. Twice baked. Never fried. Authentic baked. Bagel chips. No artificial flavors or colors. New York's finest snacks. Try them all! Pita chips. Panetini®. The thing to Bring™. Questions or Comments? Write: Consumer Affairs, PO Box K, Roseland, NJ 07068 USA or visit www.bgfoods.com. More easy recipes ready in a New York minute www.newyorkstyle.com. ©2015 B&G Foods, Inc.